GIGABYTE has been a huge supporter of the PC enthusiast, gaming, modding and overclocking communities for quite some time now and is also one of Taiwan's brightest stars in the motherboard world. But in the last couple years, the company has really started to push the envelope in terms of gaming notebook design. Especially when it comes to not only making them powerful, but also as thin as possible. This became abundantly clear when we met up with their high end gaming notebook division, AORUS, at COMPUTEX 2014, and saw their product line up in person for the very first time. Along with creating thin and light gaming notebooks, the company has also enabled their products to power the latest VR platforms by also stuffing them with the most powerful GPUs and CPUs. 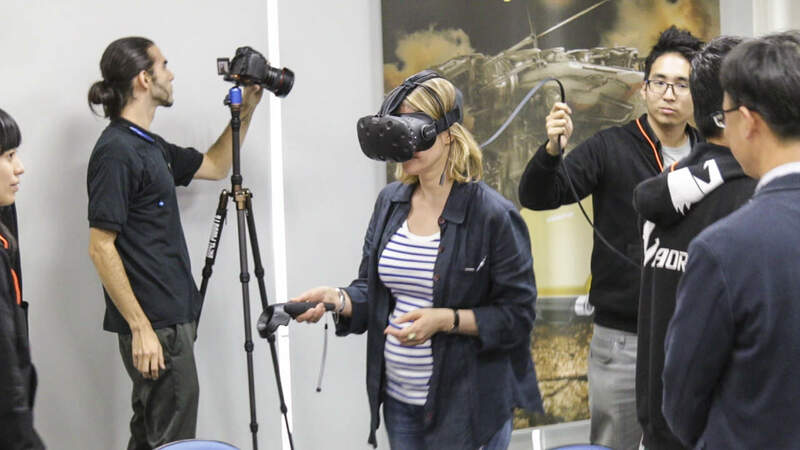 But along the way, they figured out a way to solve the most annoying problem of current VR systems which is the cable, which you can see above. Wouldn't it be nice if there was no cable? 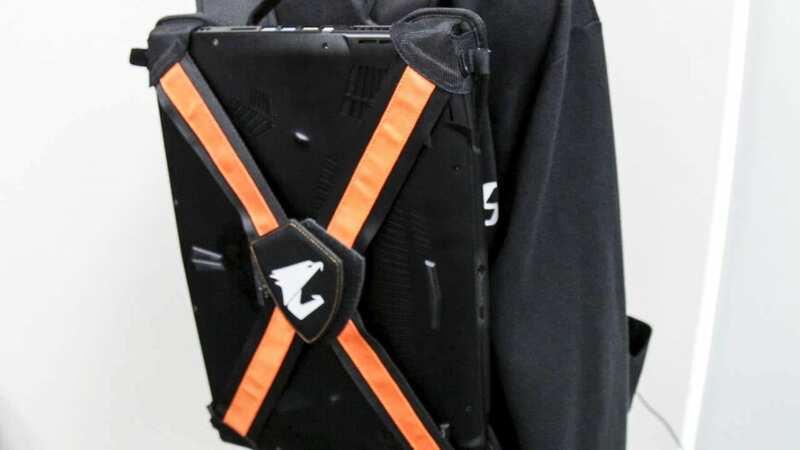 GIGABYTE's AORUS gaming notebook division figured out that the easiest solution was to make the entire machine wearable. So, they created this backpack that carries their top end gaming notebook, while allowing for your choice of VR system to be plugged in and operating, giving you maximum mobility. While battery life definitely won't be optimal with the powerful hardware needed to give you a great VR experience, it's this type of innovation that allows for new technologies like this to potentially reach mass adoption. One of the things that has made both the GIGABYTE branded and AORUS notebooks really special in this market are the paint jobs. You've already seen the vivid green and orange in one GIGABYTE's latest thin and light notebooks in the first photo, but the most impressive thing we've seen is the camouflauge paint job shown above. And it's not just a paint job. The design is actually a licensed design which is used by the military. Which probably means that if you lose your AORUS gaming notebook in the jungle, you'd probably never see it again. The most innovative thing about this paint job is that it's impregnated into the plastic meaning it'll never fade or scratch off, which is the problem with many custom paint jobs. The results are great, but because of the airbrushing process, it'll inevitably scratch and fade if you're always carrying it around, which notebooks inevitably are. 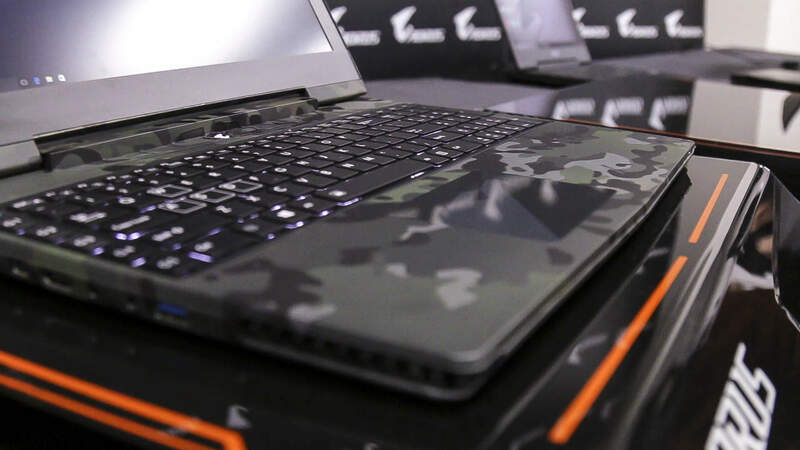 GIGABYTE is looking for feedback on other camouflage patterns to integrate into upcoming products. So, let your voice be heard in the comments below. With a growing gaming market looking for more time to game, the only option is to have a portable system that you can take with you. 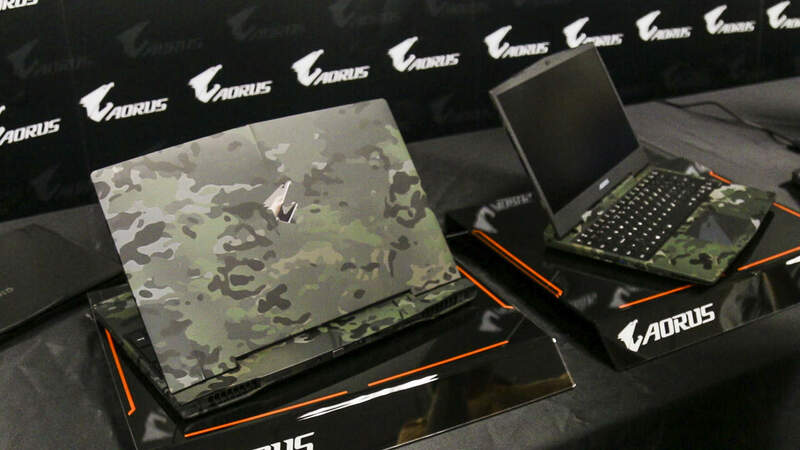 And since no one wants to carry a huge brick with them, their design philosophy of making thoughtful choices to create a product that is both powerful, thin, and light, we should be seeing more GIGABYTE and AORUS notebooks out there in the wild. To learn about more about the players in Taiwan's thriving PC gaming industry you can check out the rest of our 'A Focus on Taiwan' series.